Ever walk through a garden and feel that the insects and the birds are up to something? 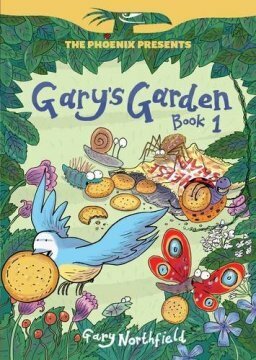 Now you can find out what in this special collection of comic strips focusing on all the birds, bugs and creepy crawlies who are all up to no good while Gary’s relaxing in his garden. A grumpy caterpillar, a space travelling ladybird and a ninja hedgehog will provide much entertainment for hours to come, and have you laughing like you wouldn’t believe! Again, a collection of fantastic comic strips which have come from The Phoenix, I am so looking into a subscription for my nephew in a few years! Gary’s Garden is awesome. It follows different creatures which will easily be found in any garden whilst they adventure and hope that Gary is bringing them food. It allows us to see into the world of insects and shows us that, yes, they are as crazy as humans can be and sometimes what they do is completely hilarious! Each strip focuses on a different group or character and I must say one of my favourites was one with very, very few words in at all called First Legs. That strip showed a collection of tadpoles as they got their legs and made their way to the pond surface to show off their new found froglet-status and left behind one poor little tadpole whose legs weren’t coming through!! I really enjoyed all of the strips within this collection. They give each animal its own personality and they are so funny I was laughing out loud. In addition to First Legs I have to give a major shout out to the Boris and Monroe strips as they were brilliant, from the characters to the art style I loved every sketch of theirs. The art was really cool, quite cartoon-y and not at all serious, opting instead for a lighter take on bugs and animals, which fit in nicely with what the narratives offered. I loved the bright colours and the effects used to make it look like the birds were flying and the worms were wriggling. I think this book will be perfect for budding little artists as they will really see what they could achieve with a lot of practice and patience. I loved Gary Northfield’s Teenytinysaurs and was hoping for a second book following those characters (I’m not gunna lie, I still am hoping for that Gary!) but this was a very good substitute! I really recommend that any lover of comics checks out the ‘The Phoenix Presents’ books, or subscribes to the comic itself as I can definitely see myself wanting more like this! Gary’s Garden was published on August 7th by David Fickling Books, as part of the The Phoenix Presents… series. My copy was sent to me from the publisher in exchange for an honest review.